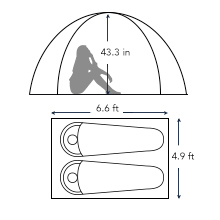 Quick Setup and Take Down – Setup up your tent within 2 seconds. 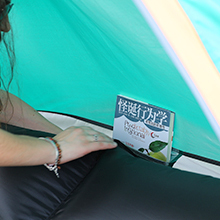 It is an automation instant portable free standing tent & proved easy to fold into a compact form – Wantdo Pop up tent is ideal and convenient for family camping, beach, backyard, backpacking and any other outdoor activities. Comfortable Space and Features - Large room for 2 persons. Dimensions - L 6.6ft x W 4.9ft x H 43.3 in. 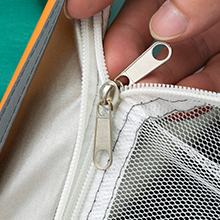 Extra 2 inner pockets provide enough space to store your Iphone, wallet, keys, and small tools. UV Protected - UV 50+. 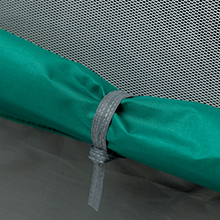 190T Polyester with silver coating provides 99% UV protection from the sun's harmful rays and keep you cool. Convenience and Ventilation – Two doors that convenient for people to enter and exit. Moreover, a combination of inner zippered screen plus outer zippered polyester layer gives an ability to easily switch between high breathability and complete privacy. Also mesh windows keep the mosquitoes and insects out, that offer you an ultimate night of comfort. Carrybag & Accessories - Coming with a carry bag with two shoulder straps that's ideal for storage and carrying it along, and in additional, a small bag for accessories including 4 guy lines and 8 stakes – occupies little space in your car, trunk or even when stored at home. Package size is about 23.6x23.6x1.2inches. What's included in the carrybag? How to clean the tent? Use a sponge and mild soap to clean up a dirty tent. Do not take a washing machine to clean your tent. Always let your tent air-dry before repacking. Dimensions - L 6.6 ft x W 4.9 ft x H 43.3 in for up to 2 persons. Fits two sleeping bags or double self-inflating pads. 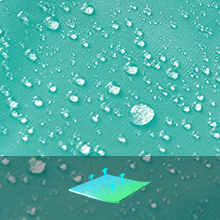 Polyester with PU1500mm keeps water out and keeps you dry on light rainy days. 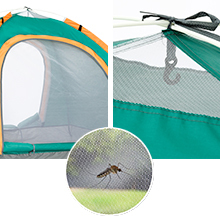 Mesh roof panels and two big mesh doors provide excellent ventilation, also keep the mosquitoes and insects out. 2 inner pockets can organize small Items such as your IPhone, keys, wallet or any small tools. 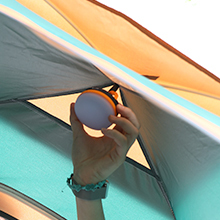 One roof hook provide a good position for the camping lantern, you can enjoy the light even in the night. Front and rear door curtain can be rolled up, easy to enter and exit, provides a beautiful panoramic view. 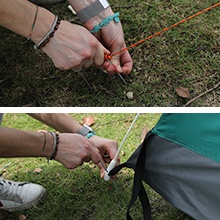 Double zipper puller makes it convenient to open and close the door when you inside of the tent. Stake tent by driving stakes through the rings on base of the tent for more stability.